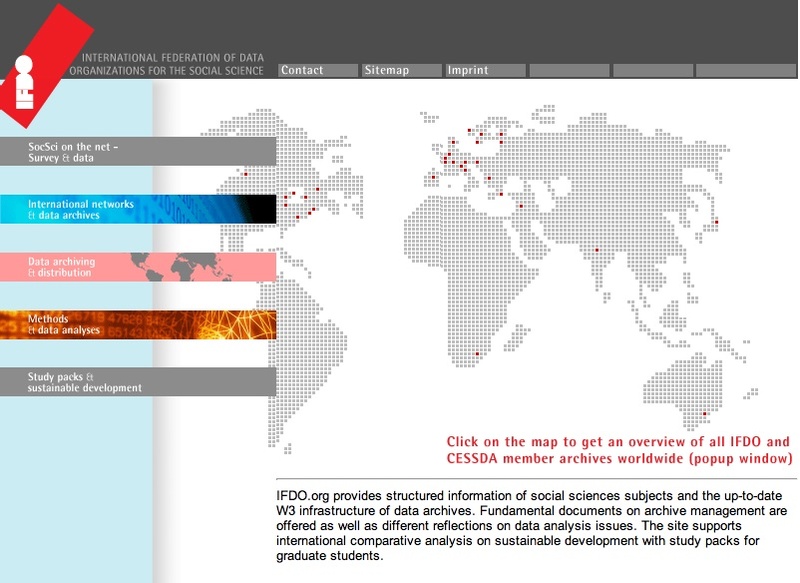 Created in 1977 the International Federation of Data Organization (IFDO) maintains associate memberships in the International Social Science Council of Unesco and enhances social science research coordinating worldwide data services. Its website provides mainly structured information on social sciences topics and above all, as a gateway, it offers links to data banks and archives. Different hypertextual essays and papers on data analysis collection, storing and archiving are retrievable, as well as information about national and international surveys in html format. For each data archive link a classification and detailed annotations and descriptions are offered, with an efficient linking and hypertextual structure. Access to these metadata, papers and codebooks is open and free for all users. Then access to data archives depends on each archive’s policy. Even if the website’s organization of contents is quite complex, a site map and other more elementary tips enable immediate orientation. Just few search and downloading options are provided, with browsing and on-screen saving. The site appear to have a slow updating rate, while its simple design could be improved by adding some dynamic elements.